About 13 km / 8 miles return. This is a dramatic and hilly coastal cliff top walk from Hastings to the hidden and very pretty Fairlight Glen beach (which is used by naturists), and on to to Fireheights beacon - with fine views of the surrounding coastline. There are 4 options for the return: a) by the same strenuous route, b) a beach route past a newly formed undercliff, c) a forested route which contours around some of the steep glens of the coast path, and d) an inland route via North's Seat (hill). In fact any of the 4 routes could be used for either the out or return journey. Finally, at the start (or finish) of the walk, there is are options to visit Hasting's working sea front with its art gallery and shingle beach launched fishing boats, its old town with shops and cafes, and a city centre hill to visit the ruins of Hastings' castle. There are already 2 SWC walks in this area, TOCW2 Hastings to Rye, and TOCW1 Rye to Hastings - this walk, and they, all share the dramatic cliff top walk out of Hastings. This walk aims to make a circular walk back to Hastings, giving time to visit Fairlight Glen beach, and further explore this very pretty coast. Why? Beyond Fireheights (the route onwards to Winchelsea and Rye) by Fairlight village, the coastal path has fallen away, and the new "coast path" is actually inland along (quiet) roads for quite some distance - an anti-climax after the coastal views at the start of the walk. The 2 routes meet up at the old town, a narrow pedestrianised lane full of old pubs and small independent shops. In front of the old town is the working beach, with its distinctive black clapperboard houses, beach launched fishing boats, Jerwood Art Galley, and a nice view from the sea wall. The best route, indeed, one of the best walks in southern England, but strenuous with 4 very steep hills to climb, is the cliff top path. There are coastal views throughout, steep ascents and descents, and places to explore if you wish to take your time. The first hill is at the end of the beach by the funicular railway, with views over the town, the castle hill and the seafront. Then you descend into Ecclesbourne Glen (valley), which has no beach access despite the appearance of a path (there's a cliff). Then its over another hill and down into the forested Fairlight Glen. Here there is an option to visit Fairlight Glen Beach. At the valley bottom is a wooden fence, and warning sign saying the path to Fairlight Glen beach is closed. Don't be put off, the beach is a highlight of this walk. Clamber under the fence, and follow the path through the trees with glimpses of the sea ahead. It has wooden steps, and is very well maintained by locals rather than the County Park. The 'official' path was washed away by a landslip some years ago - the land here is moving, and forming an undercliff around Fairlight Glen beach. The beach is now (2012) particularly pretty - the landslip has been recolonised by plants. The bay surrounding the beach is an amphitheatre shaped bowl of trees, without a single building in site. The shingle beach is quite small at high tide, but at low tide the beach is quite large and sandy. There are submerged rocks, so if swimming, surf shoes are recommended. Even on a sunny day, there are usually only a few people on the beach, mainly naturists. The beach is marked on OS maps as Covehurst Bay, but most people refer to it as Fairlight Glen. See beach route below for more on beach walking. Then its back to the cliff top path, to climb out of Fairlight Glen, in order to descend into Warren Glen. There are faint paths to the seaward side on the way down - these lead to a headland with fine views over Fairlight Beach - you could scramble down to the beach this way. The 4th and final hill is Fireheights - a beacon point with some coastguards cottages, and dramatic views back to Hastings, and on over Kent to Dungerness and the north downs beyond Ashford. Here you can walk inland to the Coastguards Cafe or have a picnic before choosing your return route. Just past the cafe is the 18th C. St Andrew's Church. Its tower has a panoramic view, and is open weekends and bank holidays from May to September, and Friday afternoons during August. The beach route is interesting, but it is very hard work hoping from rock to rock, or walking on shingle slopes. Do wear hiking boots! Beware of 2 things - tides - you will be cut off near Hastings at high tide, so make sure you do this on a falling tide. Also, as the coast is eroding, this is a "missile hazard zone" - i.e. falling rocks. After the black claperboard fishing huts at the end of the beach, carry on past a car park, and warning signs, and walk along the shingle or rocky seabed beneath the cliffs. This is easier at low tide, but still hard work. After 1 km you come to the mouth of Ecclesbourne Glen (no access - there's still a cliff). After another 1km, there is a new undercliff formed by collapsed cliffs, on which vegetation is just starting to grow. You can walk over the undercliff, or continue rock hopping. Eventually, after 1km you come to Fairlight Glen beach. Even though this route is flat, its much harder work than the cliff path! You do get to explore a new undercliff though. It is possible to carry on (off route) along the beach past Fairlight Glen. The going is a bit easier, but still hard. You'll pass a new coast defence scheme (built in 2012), and after 3km, reach a lovely large sandy beach, with a concrete boulder sea wall in front of the collapsing cliffs. Note that there is no public coast access here from the cliffs above. You could easily climb up in an emergency, but you'd need to walk through someone's garden to reach the road. There were 2 public footpaths here, long since washed away, but there are no plans (as of 2012) to reinstate them (despite the coast protection work going on, involving a temporary road down to the beach). After the 1 km long bay is a headland where you will be cut off at high tide. Around it (0.5 km) is Petts Level beach. So only do this on a falling tide. Head inland from Fireheights, towards the Coastguard's cafe. Follow a series of (level) paths to the disappointing summit of North's Seat. Although it's the summit of the series of hills that form the County Park, there is no view to speak of. Follow a quiet lane back to Hastings. Perfectly pleasant, but again an anticlimax after the cliff top path. So, there is no really good answer to choosing you return route, the beach route is interesting, but far too much like hard work, and the other 2 routes are an anti-climax. If you are fit enough, or take you time, and stop off along the way to explore, picnic, or admire the view, out and back by the cliff top path is the best choice. Trains from London Charing Cross, Waterloo East or London Bridge to Hastings take around 1 hour 30 minutes. Trains are half hourly in the day, but check the return times, as they are much less frequent in the evenings. There are half-hourly buses between Hastings and Fireheights village – routes 100 and 344. Coastguards Tea Room, Coastguard Lane, Fairlight, Hastings, East Sussex TN35 4AB. Tel 01424 812 902. www.coastguardstearoom.co.uk Opening times: April to October: Weds-Sun and bank holidays 10am - 5pm November to mid December, and February to March: Friday, Saturday and Sunday 11pm- 4pm. Quirky tea room, a few tables outside (no view), many inside - a few in the conservatory have a stunning views. Bottled beers at very reasonable prices. 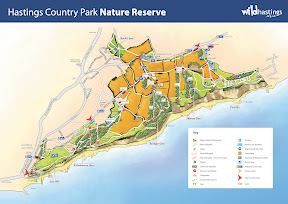 [Apr'18] - The coast path is still closed, and will be for at least 18 months. There is an inland detour. Unofficially, (and at your own risk), its easily passable (in dry weather). Locals are trying to keep the path clear, but it may become overgrown again by the end of summer, when secateurs / long trousers might help. Do your bit to help by trampling down any nettles on the path! Ecclesbourne Glen is a hanging valley [*] on the the coast path between Hastings' East Hill and Fairlight Glen. The coast path was closed at this point after a major landslip in winter 2013/14. A replacement path was destroyed by subsequent landslips in winter 2014/15. No further attempt to repair it has been made. There were further landslips in winter 15/16. Further landslips are possible after this winter's freeze/thaw and rains. [*] The Glen doesn't quite go down to the beach, there's a low cliff at the end, just a little too high to climb up/down. This is a safe inland detour for the TOCW2 walk (the TOCW1 walk does the same route, but in the opposite direction). See the OS Map page for details. Take a map - the diversion is poorly signed locally. From East (Hastings) to West (Fairlight) : from the top of the lift at East cliff follow the cliff path as per the book for 600m then turn half left across the grass your direction 60° to Rocklands Lane. Walk along the lane for 250m an then turn right for 20m to come to an open area were your turn left your direction 75°. Follow the footpath for 250 m to come to directional bollard No 5. Turn half-right here your direction 90° for 290m to come to directional bollard no 7. Turn sharp right at the bollard your direction 200° initially and in 260m as you exit the woods turn half-left and go through the gate across the field your direction 120°. In 80m go thought the next gate and turn half left to rejoin the Book 2 route. After leaving Hastings Station, head down to the sea front (south on Havelock Road), passing a Wetherspoons on the left, and Tesco Express on the right. Continue through the pedestrianised shopping area to an underpass, where you have a choice of routes to the Old Town. Easy Seafront Route : Go through the underpass, and continue past the shops to the sea front. Walk along the seafront road, and fork left on pedestrianised George Street with small shops, cafes, and pubs. At the end, head back to the sea front. To take the beach route (on a falling tide only) : carry on along the seafront, then under the base of the cliffs, and follow the beach all the way to Fairlight Glen beach. Otherwise for the other 3 routes, take the narrow stairs just before funicular, and climb up to the top of the hill (i.e. to the top of the funicular). There is a County Park information board and marked bollard (point #1). Carry on over the grassy hill (East Hill), keeping near the cliff edge. Just follow the coast, but in more detail. Go down into the valley. There is no beach access despite the faint path. Head straight back up the other side of the valley to #3. Follow the cliff top path (passing #8) to #12, where you go down into Fairlight Glen, passing #14 to reach #16 at the bottom. The path to Fairlight Glen beach leaves here, on the other side of the fence and warning sign (on the left hand side of the small stream). To continue, carry on. In more detail: Go uphill to #17, then down again at #18 into Warren Glen. Continue on, up again at #21, keep right at #22, still up, until you come to Fireheights. Follow the road inland for the County Park visitor centre. Keep right for the Coastguards cafe, car park, and St Andrew's church. Contour around Fairlight Glen at #14, heading inland to #15, then back to the coast again at #17. Note: You could avoid all the ups and down by following the quiet Barley Lane all the way from Hastings' East Hill to Fireheights, however, it is between hedges for most of the way, with no views. Contour via #5, #7, #9 as above. But at the junction after the reservoir, head inland (north) instead. You reach Barley Lane, where you turn right. Then just past #11, turn left (north). Cross the main road, and continue north along Mill Lane. Veer left to North's Seat. Leaving, take the path southeast to a small car park by the main road. Cross it, and head south to the junction with Barley Lane, turn left, and follow it all the way to Fireheights. At #20, there is a shortcut left to the Coastguards cafe and visitor centre.